After spending a week exploring the Galápagos Islands with my brother I was back to rolling solo. Tyler caught an early flight out of Guayaquil and I hopped on the 4:00 AM bus to Cuenca. The road meandered through lush green mountain highlands and led into town shortly after sunrise. I grabbed my pack and walked downtown to find breakfast and do some work. 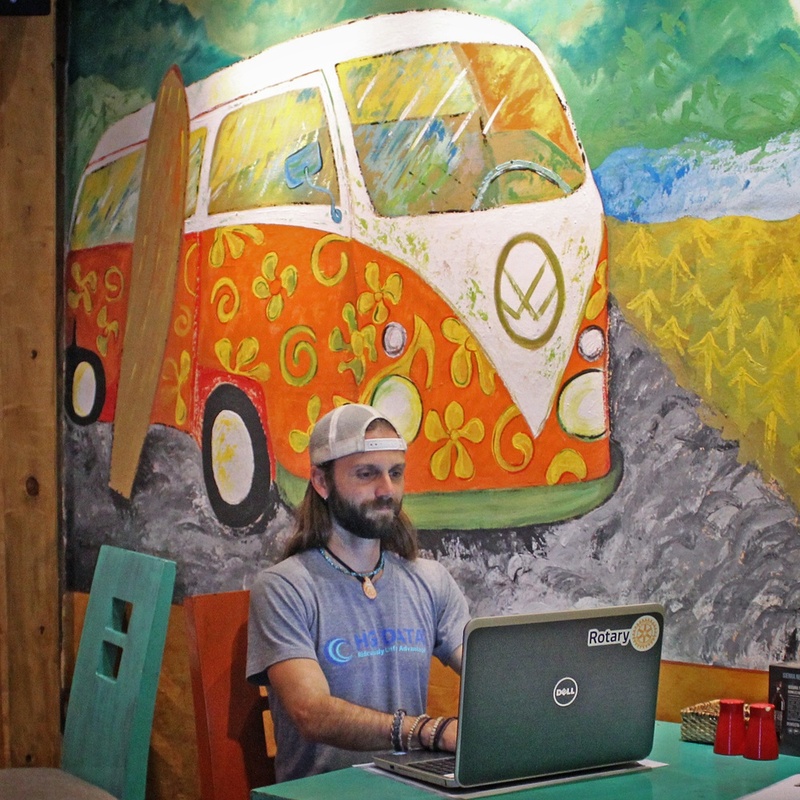 The first cafe I walked into had a giant hippie van painted on the wall. I took this as a good sign and posted up for coffee and a few hours of productive work. That afternoon I checked into my hostel and settled into my home for the week. I met several other travelers from around the world, picked up groceries, and explored the museum across the street, including some Inca ruins. Cuenca is definitely the most beautiful town I’ve visited in Ecuador. The red tile roofs, Spanish architecture, and cobblestone roads made the area feel historically romantic. Each day I donned my running pack and spent a few hours traversing the town, exploring the hillsides, and trying to make it back to the hostel before the afternoon rain showers. 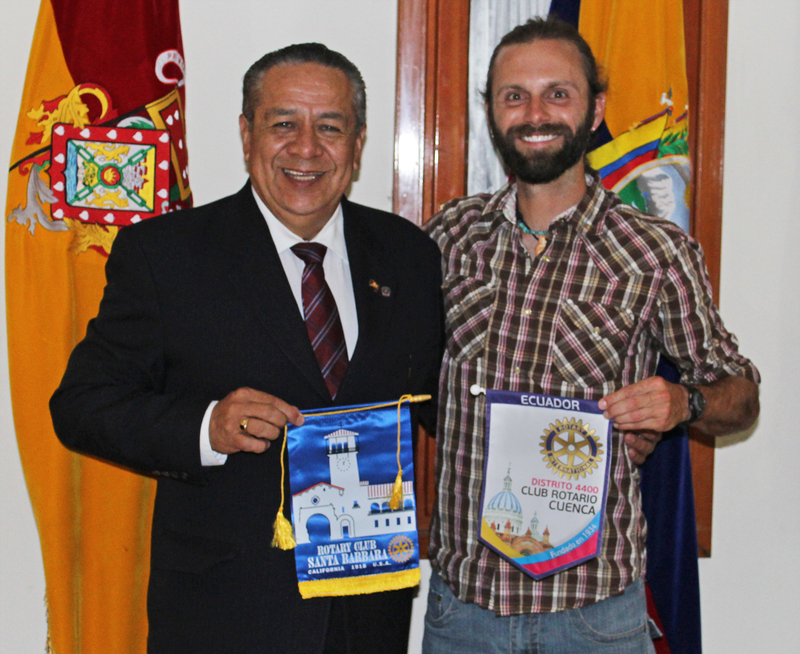 After traveling around Ecuador for over a month I was finely able to visit a local Rotary Club. I attended an evening meeting with the Rotary Club of Cuenca (Club Rotario Cuenca). The entire meeting was done in Spanish so I only caught about half of it, but the members were very welcoming and kept reminding me that we are all one Rotary family. 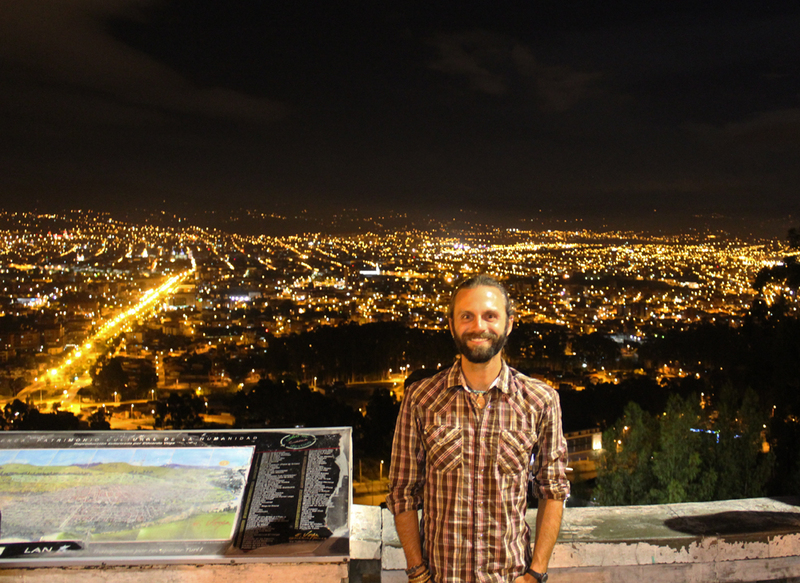 Edgar, a professor at the local university, offered to drive me back to my hostel after the meeting and took me to the top of Mirador de Turi to see the sweeping views of the city below. Cuenca was also a very social town. During one of my afternoon runs I noticed a Volkswagen Westfalia van from New Mexico and stopped to introduce myself to Ben Hurst. He is driving his van to the tip of South America and has been on the road for nearly a year. I also met a fellow Appalachian Trail Thru-Hiker in my hostel. Rufio hiked the AT in 2009 and we met up with Ben to grab some cold craft beers and talk hiking, living in vans, road trips, and international travel. Later that week I joined Rufio for a day hike in Parque Nacional Cajas, a National Park only an hour bus ride out of Cuenca. 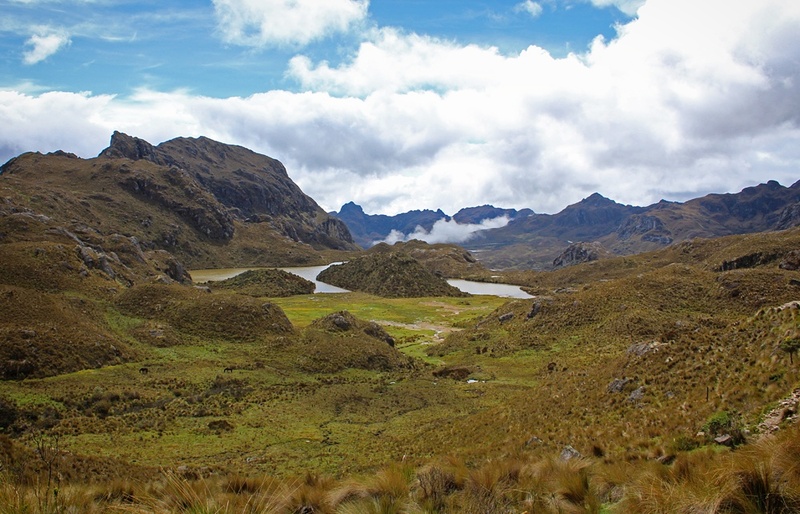 The name Cajas is said to have come from a Quichua word meaning “gateway to the snowy mountains” as well as the Spanish word meaning “boxes” because the scattered highland lakes look like boxes nestled between the exposed peaks. The hike was gorgeous. We passed through valleys following the perimeter of lakes and crossed a few high passes, one being 4,250 meters above sea level, or just under 14,000 feet. We saw a few local residents riding horses across the landscape, but most everything else was quiet with tiny wildflowers blowing in the gentle breeze. 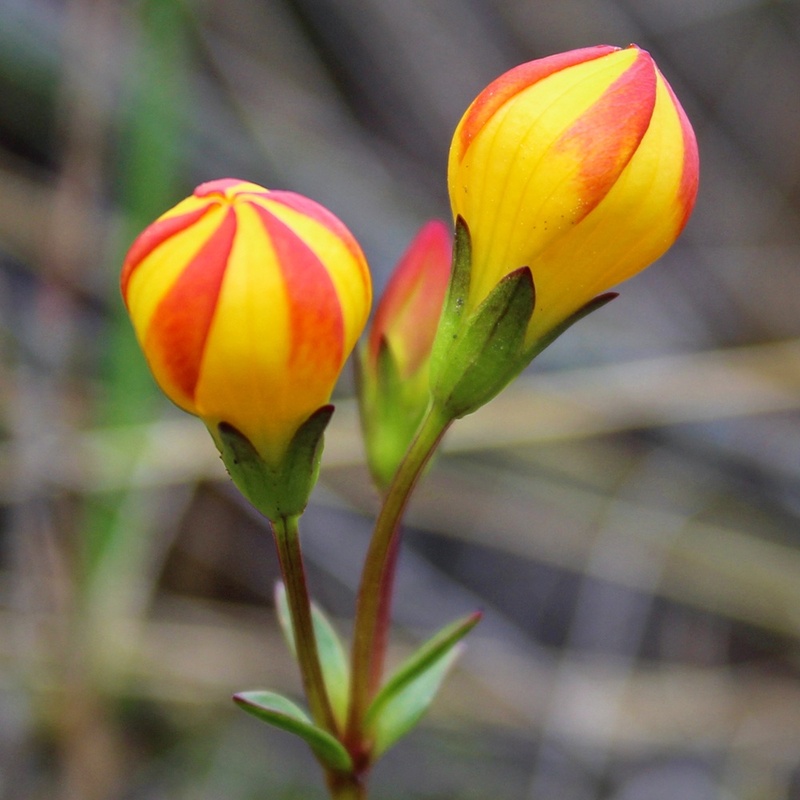 The unique ecosystem hosts several plants only found in Ecucador, including Gentianella Hirculus, which look like little brightly colored beach balls. By the end of the week I was ready to move on. 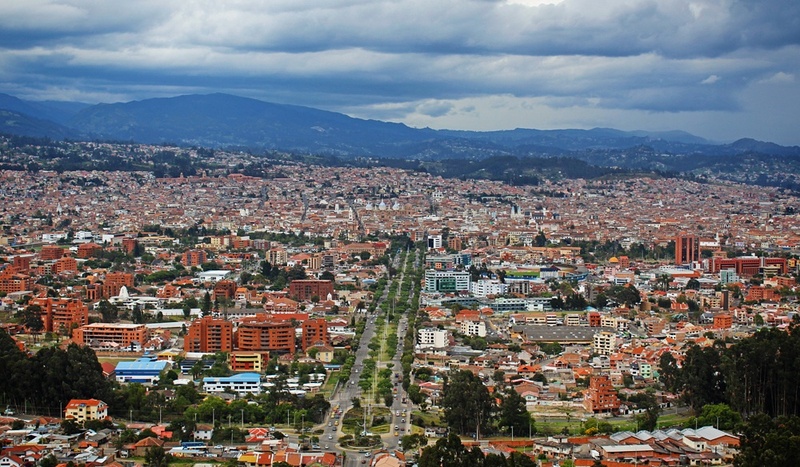 Cuenca was definitely my favorite city in Ecuador so far, but I needed to continue south. I had explored much of the city, hiked in the National Park, and completed enough marketing work to pay for my next month of travel. I packed my bag again, said goodbye to new friends, and headed back to the bus terminal. I was headed 6 hours south, to the Valley of Longevity, Vilcabamba. Pingback:What Do Appalachian Through Hikers Do Next? – William Kemsley Jr.
Hi Chris, Your story is very inspiring. At the end you say that you are doing marketing to pay for your next month. I am sure there are a lot of people that like to do the same. I don’t see any ads on the sidebars and don’t see you selling anything such as an ebook or products. What are you marketing and how do you make money to pay for your trip? Thank you in advance. Alee, thanks for the message! The freelance marketing I do is for corporate clients. I manage corporate websites, social media accounts, and prepare for the company’s trades shows and marketing materials. My personal blog is just for fun, my income comes from billing hourly marketing work to various businesses. Thanks again!